I received a comment to last month's My Sentimental Library blog from Chris Larizza of Stratford, Ct. regarding a book by J. O. Halliwell-Phillipps. 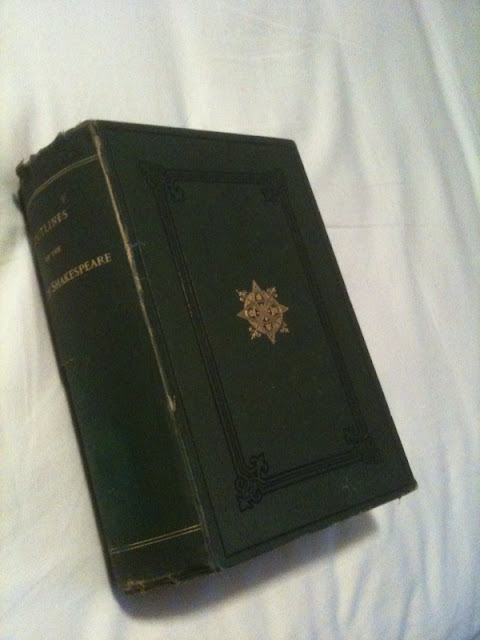 He recently acquired a presentation copy of an 1882 second edition of Outlines of the Life of Shakespeare by J. O. Halliwell-Phillipps at an estate sale and queried me as to its value. 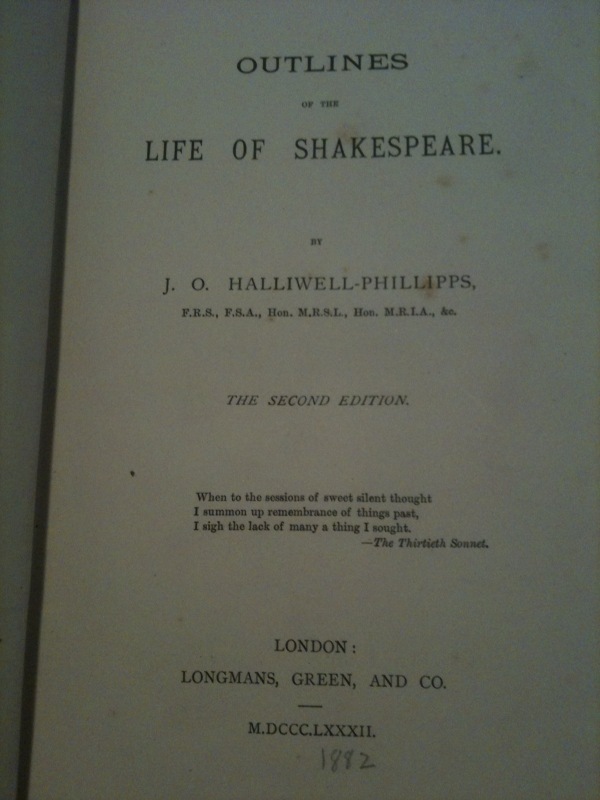 Outlines of the Life of Shakespeare By J. O. Halliwell Phillipps, F.R.S., F.S.A., etc. 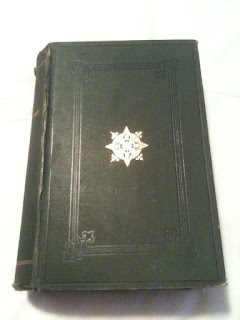 The second edition, London, Longmans, Green & Co, 1882, 8vo, pp. 703. This book is a bibliographical curiosity, for the reason that in 1881 Mr Halliwell Phillipps printed it privately in an octavo volume of 192 pages, and within a year he has produced a second edition nearly four times as big, and now sells it for 7s 6d. It is certainly one of the cheapest books ever published. 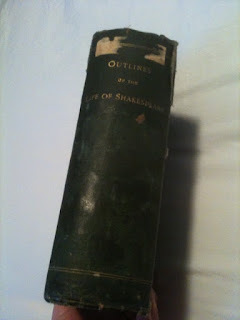 We do not propose to review the book as a life of Shakespeare because it is so full of matter, and contains so exhaustive a treatment of the information connected with its subject that we should need a whole number of our journal to do anything like justice to it, and moreover such a review would be more appropriate elsewhere. We wish however to draw special attention to the mass of bibliographical information which it contains. Mr Halliwell Phillipps has for so many years made a practice of studying the literature of Shakespeare's time for illustrations of the poet's life and works that any book which he produces is sure to be full of bibliographical detail. At p. 527 we find a series of copyright entries from 1593 (of Venus and Adonis) to 1623 (of the plays for the first folio). An account of lifetime editions follows these, and then there is a full account of the first folio. The volume is completed by the addition of a Documentary Appendix which contains particulars of all those documents that are important as giving us authentic information on the particulars of Shakespeare's life. These number fifty in all, and range from the conveyance (dated 17th July 1550) by Robert Arden, Shakespeare's maternal grandfather, of a house and land at Snitterfield, in trust for his three daughters (this farm was then occupied by Richard Shakespeare the poet's own grandfather), to some anecdotes respecting Shakespeare written in 1693. We have in this volume all those facts connected with the life of Shakespeare which are certainly known and we can find them kept apart from the conjectures so frequently hazarded in books of a similar character. "This volumes deserves commendation for its uncommonly moderate price as well for its very valuable contents." The low price surprised me because many of Halliwell-Phillipps's works were published in pricey limited editions of 150 copies. In writing his obituary, a writer in The Critic said he once asked Halliwell-Phillipps why only 150 copies were printed of most of his works? Halliwell-Phillipps replied that some collectors would pay extremely high prices for limited editions, but wouldn't even consider buying unlimited editions. As for the 1882 edition of Outlines of the Life of Shakespeare being a bibliographical curiosity because of the vast expansion of its pages, I am reminded of Thomas Frognall Dibdin's book, Bibliomania. The 1809 edition was a mere 87 pages. But the 1811 edition was a whopping 782 pages! * Some sources cite 786 pages. ** COPAC was the source cited here. I don't know why the size decreased. *** Some sources cite 848 as the number of pages. As far as literary value goes, the 1887 edition contains the most pages, but the early editions are nothing to sneeze at. I would want to compare the 1887 edition to the 1882 edition, and see how much the extended quantity of pages contributed towards an increase of literary value. There were even editions published after Halliwell-Phillipps's death: an eighth edition in 1889, a ninth edition in 1890, and a tenth edition in 1898. These editions were simply reprints of the 1887 seventh edition because the number of pages remained the same. The year 1898 marks the end of Halliwell-Phillips's dominance because that is the year that Sidney Lee published his biography of Shakespeare. 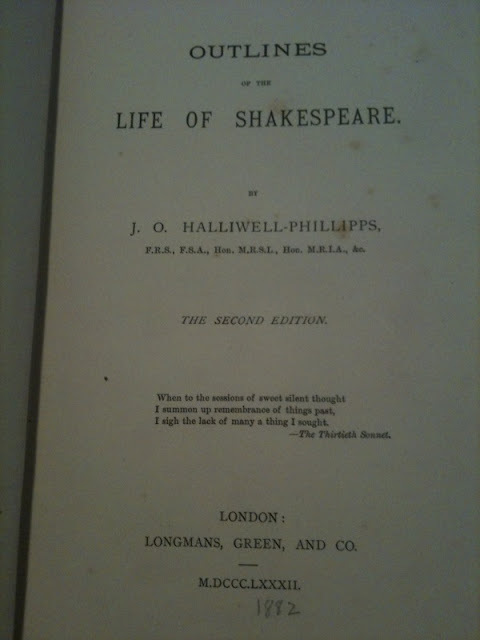 For over forty years, Halliwell-Phillipps researched and wrote about Shakespeare, leaving Sidney Lee and the many Shakespearian authors to follow a mountain of Shakespeariana to borrow from. As far as monetary value goes, there is no mountain of information to research in order to determine the monetary value of the Larizza copies of the 1882 edition of Outlines.... There is only one copy of the 1882 edition listed for sale on the web. There are no listings of a presentation copy of the 1882 edition for sale on the web. Charles Parkhurst Rare Books in Prescott, Az. has a copy of the 1882 edition listed for $400, but the Parkhurst copy is in much better condition than either of the Larizza copies. Charles Parkhurst also has an 1883 edition of this work, acquiring both copies when he bought the Shakespeare collection of the late Los Angeles book collector, Jerry D. Melton. 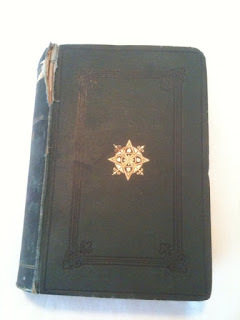 The 1883 copy is listed for $250. The cloth is frayed on the top of the spine of the second copy and is splitting along both sides of the spine. The color of both bindings is still bright and no other faults are evident. I've already provided Chris with the name and number of a professional bookbinder in Connecticut. After these copies are repaired, how much will the Larizza copies be worth? Exactly how much a buyer is willing to pay for them. The monetary value of a presentation copy depends upon the scarcity of the work, the collectibility of the author, and the prominence of the person the book was presented to. Obviously, the Larizza presentation copy is scarce because no other presentation copy of that edition is listed on the web. There is an 1887 seventh edition listed by a UK bookseller for $193 that could be a presentation copy. But how collectible is Outlines...? And how collectible are presentation copies of other works by Halliwell-Phillipps? There are only two copies of Outlines... listed on ILAB, the two Parkhurst copies mentioned above. There are eighteen copies of Outlines... listed on Abebooks, ten of which are exlibrary and in poor condition. The Parkhurst copies are listed on Abebooks as are two copies of the 1887 edition. KHP Books in Vernon Hills, Il. 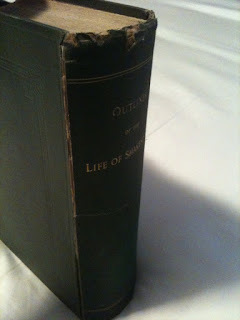 has their 1887 copy listed for $350 with the only fault being that the spine of Volume 1 is weakened. Several pieces of Shakespearian ephemera belonging to a former owner are included with the set. 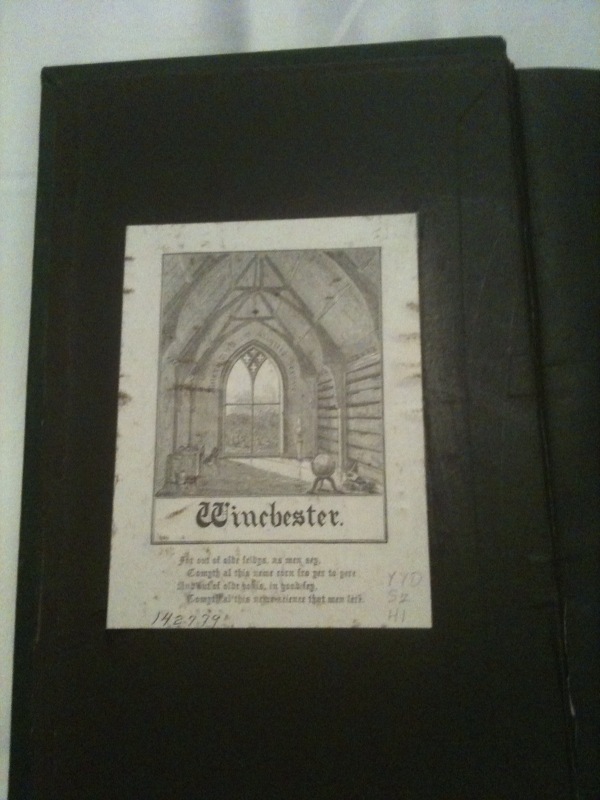 The other 1887 edition is listed by Staniland Booksellers in Rutland, U.K. This set was bound in richly decorated contemporary green morocco with raised bands and marbled boards by Henry Sotheran & Co., probably shortly after its first owner purchased it. What is interesting is that in the listing it says that this copy is "inscribed by author on half-title," which makes me wonder if it is a presentation copy. If so, I believe it is underpriced at a mere $192. The only drawback would be the postage from the U.K. to the U.S. 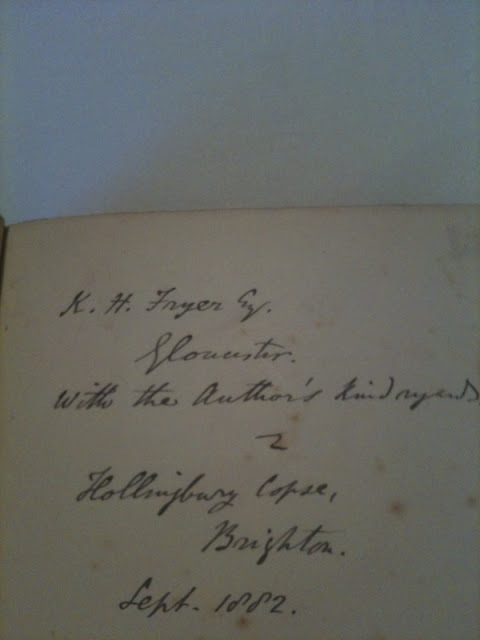 I found five presentation copies of works written and inscribed by Halliwell-Phillipps. And the Staniland copy of Outlines... was the most expensive. One of them, Memoranda on the Tragedy of Hamlet, London, 1879 was only listed for $56. That copy was presented to Sir Arthur Hodgson, an Australian politician. I have a presentation copy of this work in my own library, but I believe the provenance of my copy increases its value. My copy was presented to the author James Russell Lowell. When I bought my copy six years ago, it was listed for $100. Today I believe it would be closer to $150. But how much are the Larizza copies worth? The Larizza presentation copy of Outlines... was presented to F. H. Pryor, Mayor, Alderman, and Burgesses of the City of Gloucester. Both Halliwell-Phillipps and Pryor were members of the British Archaeological Association. I don't believe this provenance affects its monetary value. I do believe either a university librarian or a Shakespeare collector will buy this presentation copy. Once the copy is repaired, I believe it could fetch upwards of $500. And now for the second copy with the bookplate and verse from Chaucer. The book belonged to Caleb Thomas Winchester (1847-1920). He was the librarian of Wesleyan University at Middletown, Ct. from 1869 to 1885, and Professor of Rhetoric and English Literature from 1873 to 1920. He was the author of a biography of John Wesley as well as a number of articles and books on literature. The Olin Library, Wesleyan University, Middletown, Ct.
What is the name of the library catalog at Wesleyan University? Why Caleb, of course! The library has three of Winchester's books already. Why not add a fourth? In your opinion, what would an 1881 edition of Outlines of the Life of Shakespeare be worth? It was presented by the author to the mayor of Stratford-on-Avon, William Gardner Colbourne. 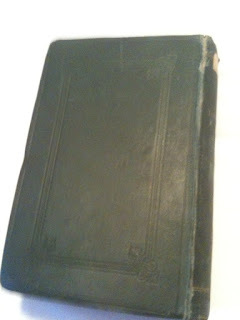 The book is in great condition with minimal wearing around the edges, primarily on the corners. I've seen no recent records of an 1881 association copy of this work, so I can't give you an estimate. How much is it worth? How much a buyer is willing to pay for it. Halliwell-Phillips doesn't appear to be too collectible at this time; Listings from six months ago and longer are still listed on the web. 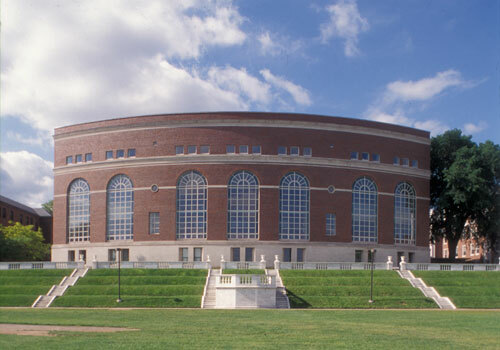 You might have better luck querying university libraries. Btw, I tried to contact you via your Facebook page. I was coming up with similar results but appreciate the second opinion. I will indeed follow up with university libraries Thank you for your time! Strange, Facebook is neglecting to show me that.